Thanks so much for all you do for our profession! I do have a question you might be able to answer – I use CamStudio but the file size is huge. I tried to use it to do a presentation for school and I couldn’t compress it enough to be able to send it to my assignments forum (limit is 10 mg) using Winzip. Do you know of another compression software that works well with CamStudio? 1. Download Winrar and install it. 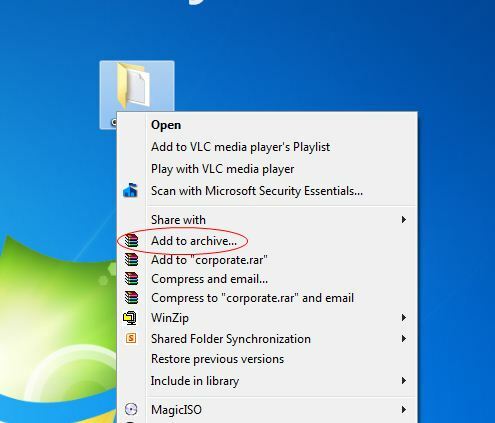 Find the file that you need to compress, right click and choose “add to archive”. WinRar automatically assigns a name for the new archive it is going to create (in this example it says corporate.rar). If you don’t like the default name, you can change it as needed. 2. 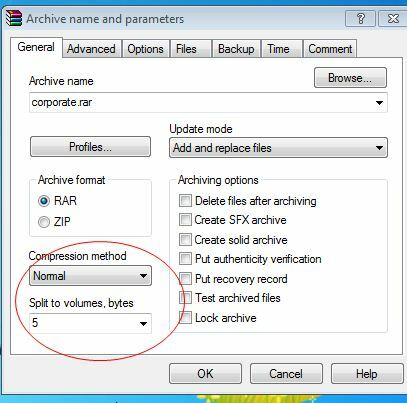 In generals tab, compression method, select normal and type in the “split to volumes”= 5 mb. If the email file size limit is 10mb, make sure that you choose a size smaller than that. Also make sure that the Megabyte unit is there, otherwise the default is in bytes. 3. Wait until the processing is over. Then it’s done. For example your original file is 50 mb and you split it into 5 mb, you will end up with 10 parts. You can now attach all of them into your email. Make sure you send it all, otherwise the recipient will not be able to open it.